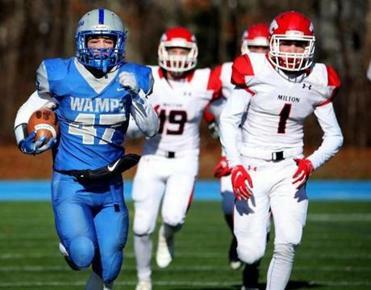 DANVERS — It was a record cold Thanksgiving Day with the wind chill dipping below zero, but the fire and intensity of the 72nd meeting between Gloucester and Danvers was as heated as ever on the turf. Danvers, though, behind strong performances from seniors Brendan Treacy and Matt McCarthy in their final game, shutout visiting Gloucester, 20-0, to return the Thanksgiving game trophy back to Cabot Road for the second time in three years. Treacy finished the game 7-for-10 passing for 66 yards and two touchdowns while also rushing nine times for 36 yards and another score while McCarthy ended his storied career with 132 yards on 18 carries and five catches for 59 yards and a touchdown. Gloucester (9-4) still leads the all-time series 46-24-2. “Every year we come out and go to war with these guys,” said Treacy. The effects of the cold conditions didn’t take long to prove itself costly early in the game. A bad snap on a punt from Gloucester after going three-and-out on the opening drive gave Danvers fantastic field position inside the red zone. Four plays later on a fourth-and-10 the senior quarterback, Treacy, connected with McCarthy for a 13-yard touchdown to go in front 7-0 early in the first quarter. Following another punt that left the Falcons with opportune field position on the Gloucester side of the 50, Treacy once again worked his magic. He rolled to his right and threw across his body to a wide open senior Almany Vargas for a 5-yard score. Going into the break with a two score lead, Danvers (9-3) put the game on ice with an 11-play, 65-yard drive to begin the second half that was capped off on a Treacy 1-yard keeper up the middle. “When you can walk out at the end of the season with a win like this [with] the sacrifice of maybe not a lot of the premier players, it means a lot,” Danvers coach Ryan Nolan said. Gloucester took a 17-play drive to the Danvers’ 11-yard line, taking more than seven minutes off the clock in the third and fourth quarter, but a turnover over on downs ended the threat and kept the shutout intact.